It can be a family car too! By: Candy Chung | The Nissan Leaf is probably the most iconic full electric vehicle in the past decade. The second generation has been completely redesigned. 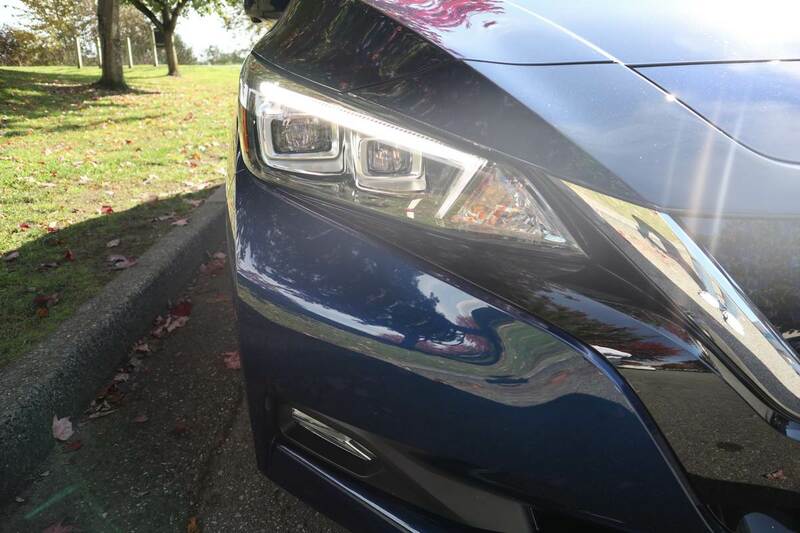 The 2018 Nissan Leaf looks different from the previous generation and I think it’s an improvement in the looks department. The first generation Leaf has a somewhat toy car appearance. The second generation looks way sharper, way smarter and way more like a traditional hatchback. The Nissan family chrome grille in the front gives it away that it’s a Nissan. The LED headlights contribute to the smart look. The rear is the biggest improvement over the previous models. Gone is the rather weird looking trunk that sticks out. The new Leaf has a much more streamlined rear that looks modern and practical. The 2018 Leaf driving dynamics match my expectations of a full electric car. The ride quality is good and the cabin is very quiet. There is no grunting or growling from the engine and the power delivery is almost instant. 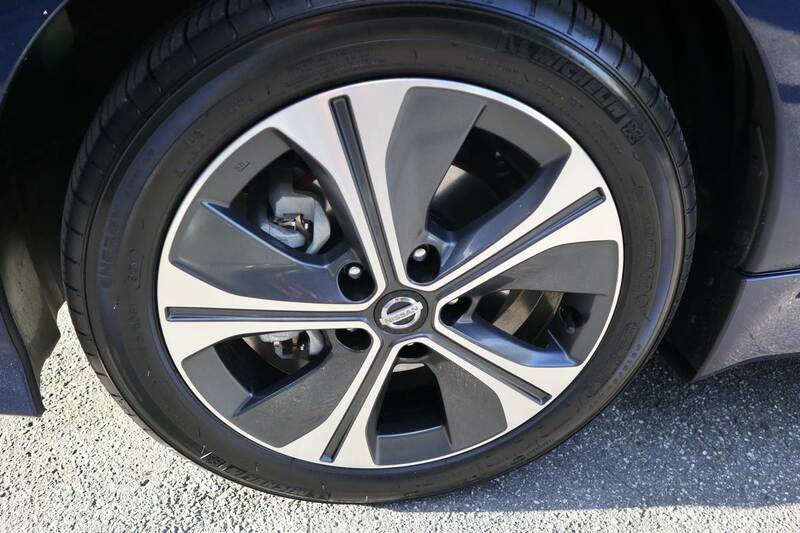 Combined with Michelin Energy tires, the car almost feels like it’s gliding over the roads. Steering is light and fairly precise. There is no obvious understeer or oversteer. The suspension is on the soft side as you would expect from a compact family car. Did I say family car? 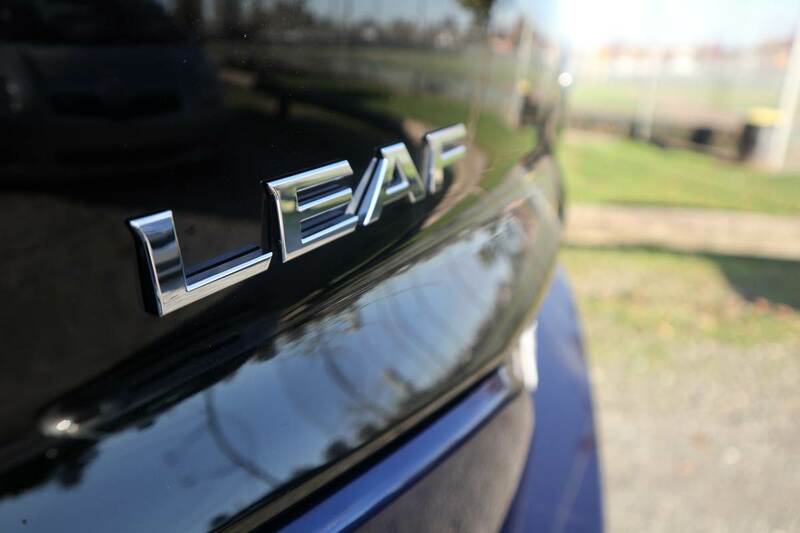 Yes, the Leaf may be compact but it’s by no means small on the inside. 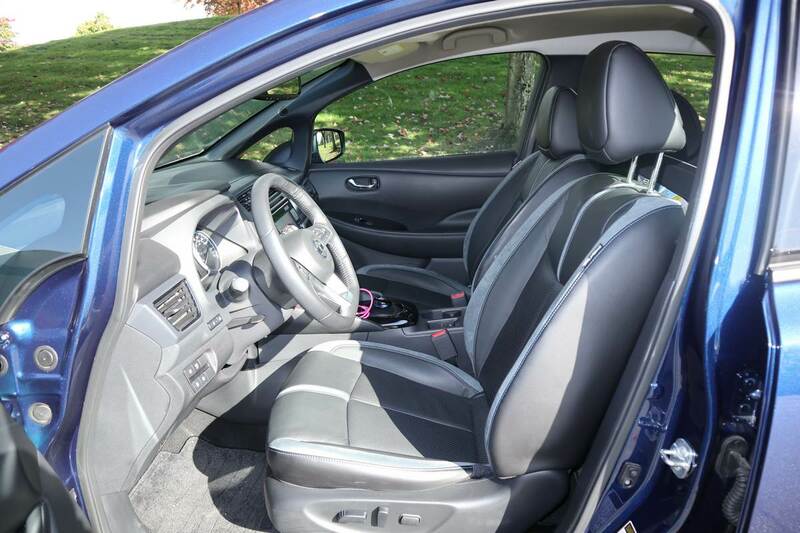 The front has ample space for two and the optional leather seats are good-sized and very comfortable. That’s one thing Nissan’s cars stand out from others. 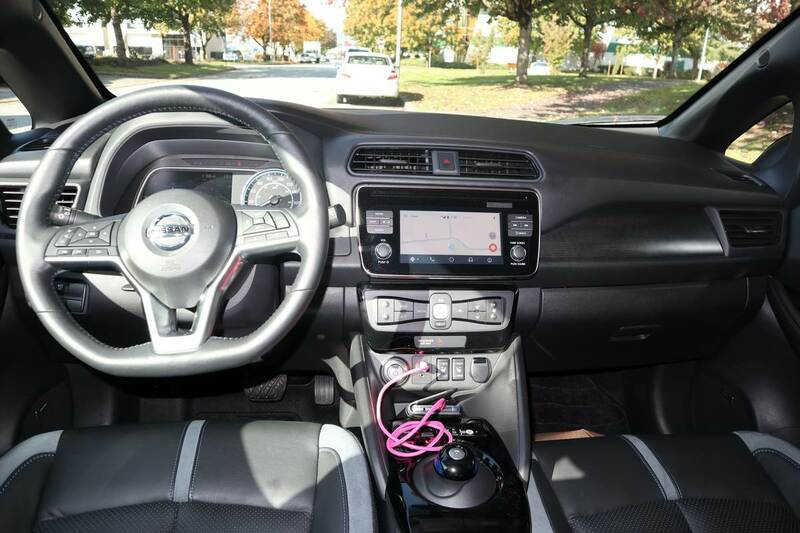 I remember when Nissan first introduced the Versa, they took the seats from the much more expensive Maxima and put them in the Versa. 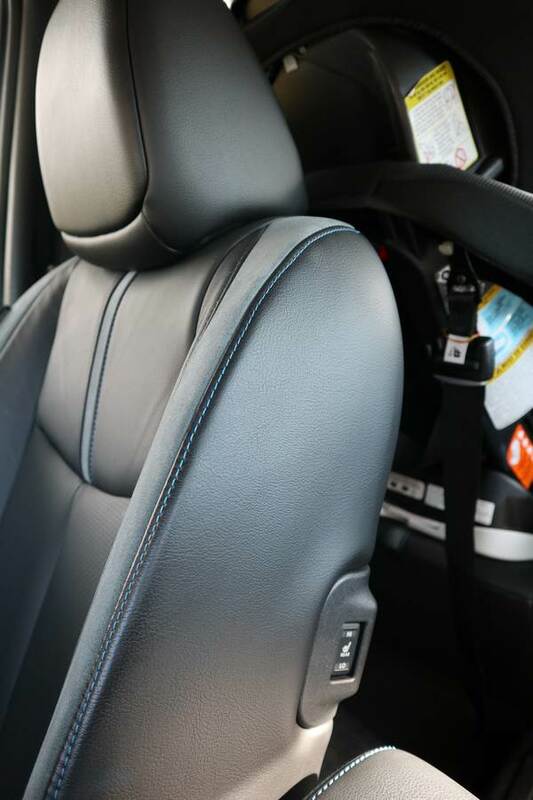 The back seats of the Leaf are comfortable as well but the leg room is not the greatest. There’s also the odd transmission tunnel in the middle of the floor which eats into leg room. The trunk does not look huge but it is indeed quite useful. I was able to fit three pieces of suitcases in it with some space for duffle bags. 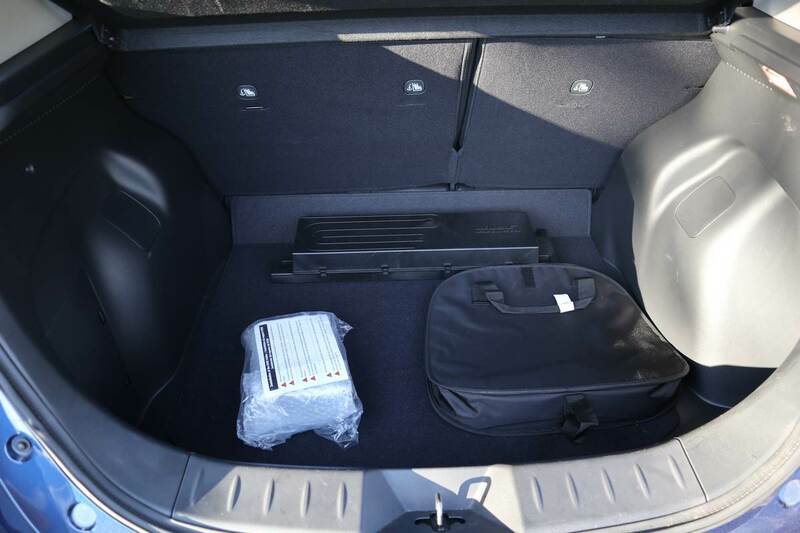 The optional Bose subwoofer takes up quite a bit of space in the trunk. 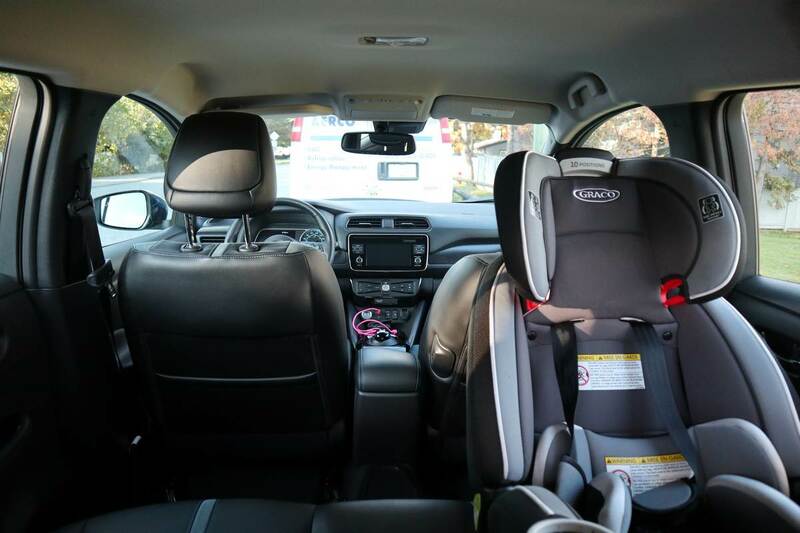 In terms of fitting a car seat, I was able to fit a rear-facing car seat with ease thanks to back doors that open wide and my child seems comfortable in the Leaf. There is sufficient but not too much cubby space. I like the cellphone slot that inclines downward to keep my cellphone from sliding all over the place. Connection to Android Auto was a breeze. 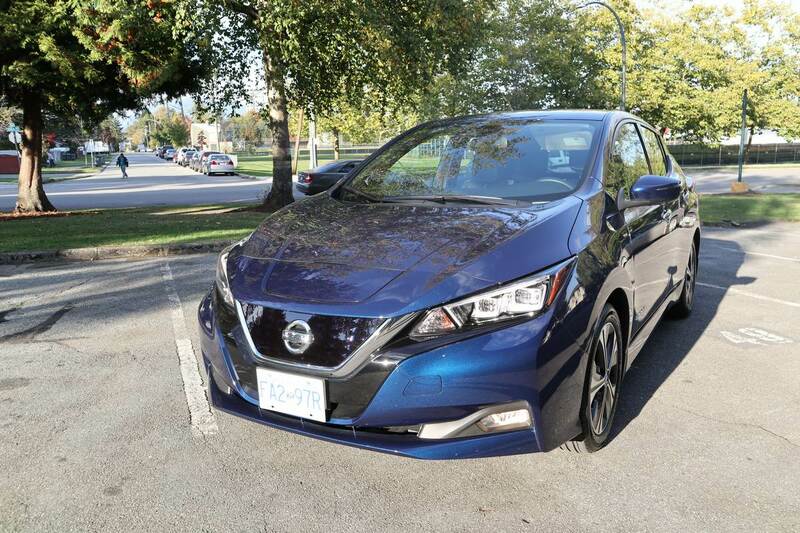 The 2018 Leaf has a driving range of about 240km when fully charged. It takes 20 hours or more to fully charge at level 1 (which is the standard outlet we have at home), and 7 hours at level 2 (240-volt). At a level 3 fast charge which my tester was equipped with, it would take less than an hour. My daily commute is about 35km round trip and I would still have more than 80% battery left by the time I get home. So, even without level 2 or 3 chargers, I was able to live with the Leaf quite easily. What’s cool and not so cool? 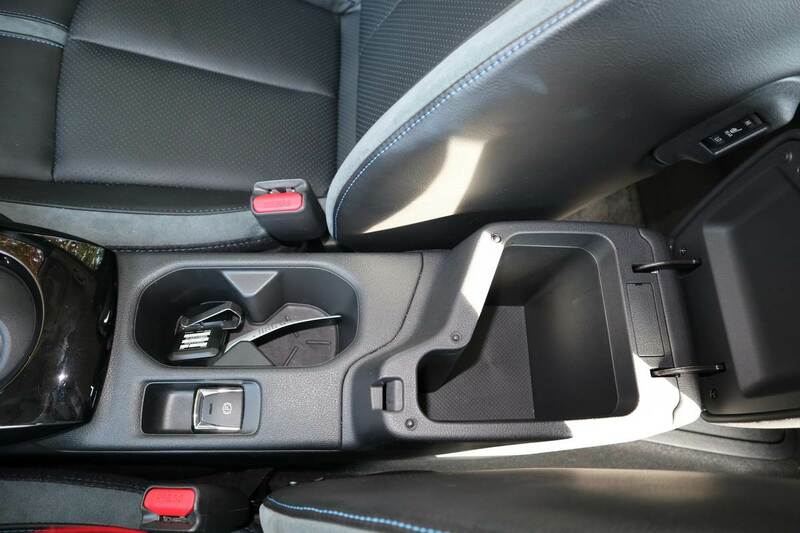 The Leaf comes with something called E-Pedal, and it’s a completely different driving experience. 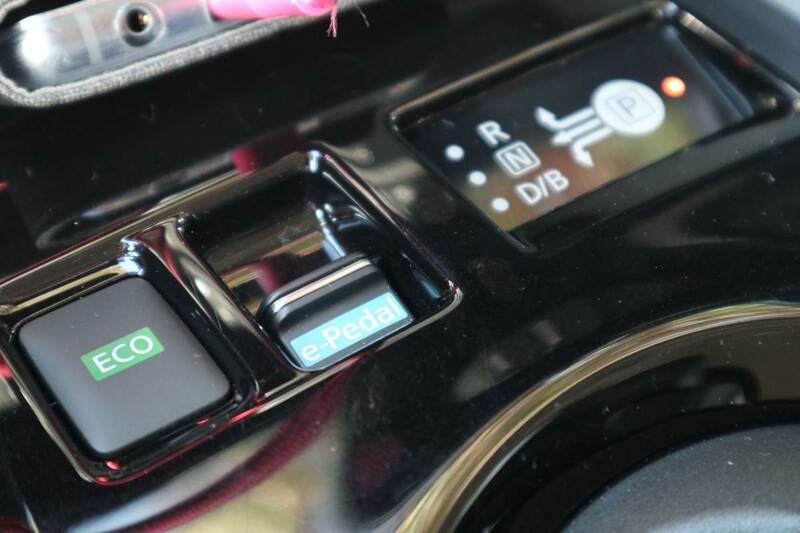 Imagine driving with one pedal only; that’s basically how E-Pedal works. The regenerative braking is so strong that as soon as you lift your foot off the gas pedal, the car slows down as if the brakes are applied gradually. It takes some getting used to and I would not recommend using it in parking lots. It is, however, useful in city driving because I can essentially drive with one pedal only and forget about the brakes unless I really need to stop suddenly. 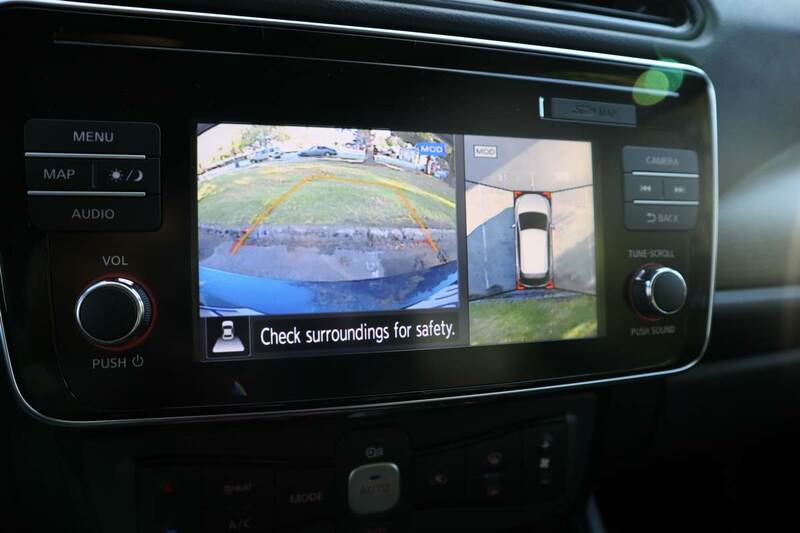 Nissan Pro Pilot Assist is an intelligent driving system that ‘accelerates, steers and brakes for you’. The Intelligent Lane Intervention system works great as the steering wheel vibrates to alert the driver that the car is going out of lane. 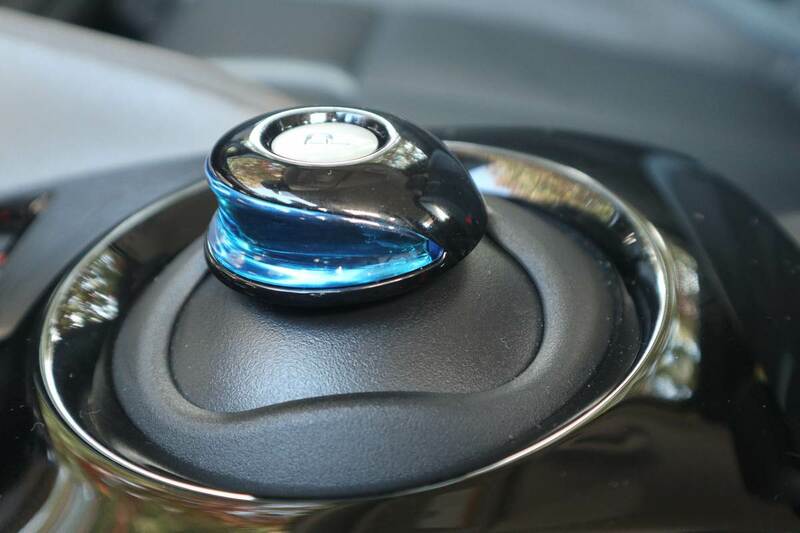 The Intelligent Emergency Braking lets the driver know when they need to slow down and even automatically engages the brakes to help avoid a collision. It’s all cool safety tech. What’s not so cool? I wasn’t exactly thrilled about the lack of memory seats. Since Nissan is already offering power seats, why not throw in memory settings? Also, the lack of telescopic steering wheel is odd. Took me a while to find a good driving position as the steering column is big, which means rubbing my knee against the steering column while braking. Compared to other electric or hybrid vehicles I’ve tested, the Leaf’s infotainment is a bit on the sluggish side and the instrument gauge is a bit plain. What’s my verdict? After putting 200km on the Leaf, I’m actually a bit sad to return it. 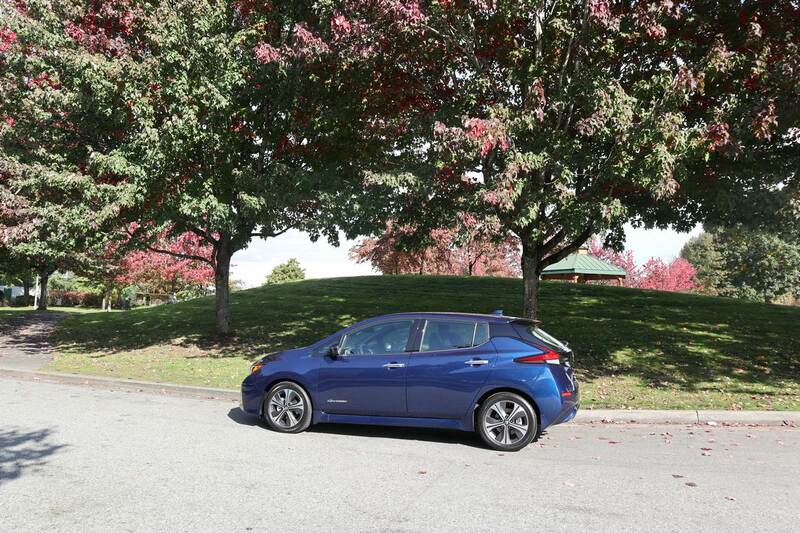 The Leaf drives comfortably, looks sharp and doesn’t burn gas. 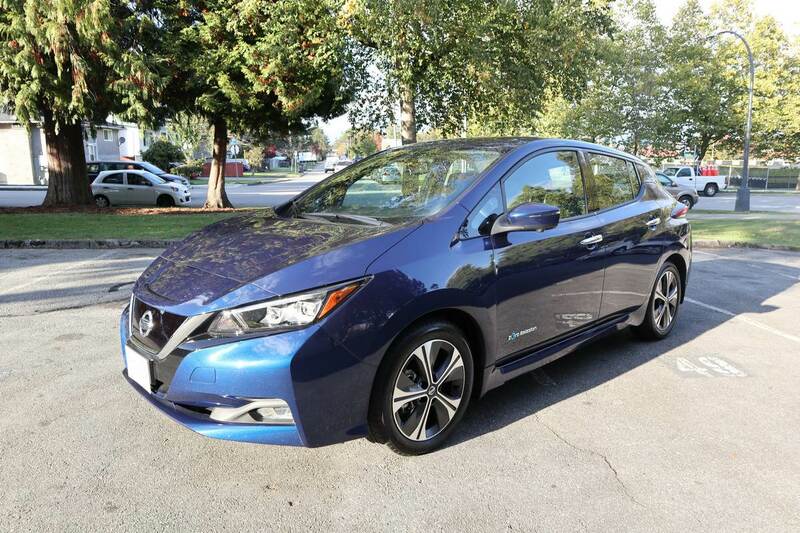 With thousand dollars’ worth of government rebate available, it brings the starting price of the 2018 Nissan Leaf to a reasonable level. 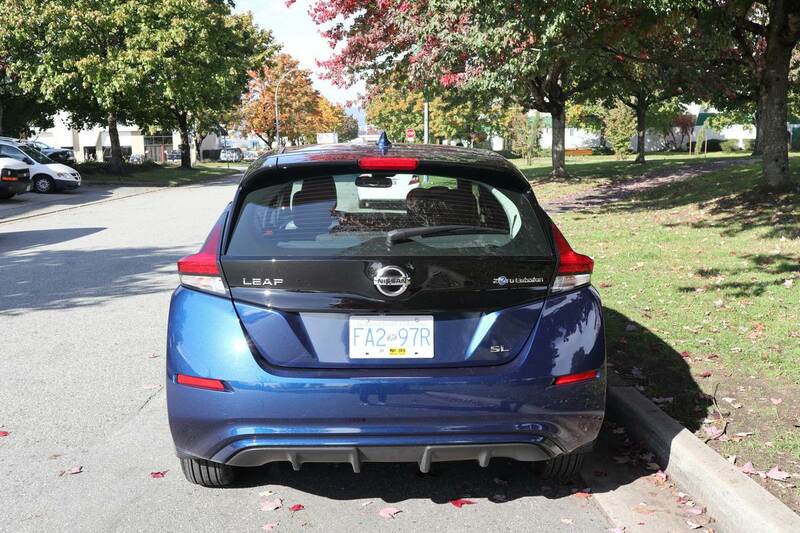 The Leaf is a good choice for anyone looking for a full electric vehicle.